Cut roasting time to less than an hour! Step-by-step instructions to cut your turkey into pieces and roast it much more quickly and evenly in a butter-wine braising liquid to keep the meat juicy and delicious. Fastest Roast Turkey ready for the oven in the Adventure Kitchen. If you buy turkey parts rather than a whole turkey, you can get just the pieces you like best (like we did here). 1. Preheat oven to 450 degrees with the rack in the middle position. Cut the butter into small pieces and distribute them evenly on the bottom of a roasting pan. Add the onions, celery, carrots, garlic, bay, parsley and other herbs, and pour the wine over everything. Step 1: Use a sharp knife to remove the legs and separate the drumsticks from the thighs. Step 2: Turn the bird breast-down and remove the wings. Step 3: Use kitchen shears or a very sharp and sturdy knife to cut along each side of the backbone and remove it. Step 4: Turn the turkey over and cut along the edges of the ribcage to separate the breast from the sides of the bird. 3. Set aside any pieces that you are not planning to serve (eg, the back, sides, etc.). While the turkey is roasting, you can use these pieces to make stock and gravy, and probably have enough left over for soup, turkey pot pie, enchiladas, and more dishes with the leftovers afterwards. 4. If your turkey has not been brined, generously season all the pieces with salt and pepper before adding them to the pan. Be sure to season all sides, including any exposed flesh. (If your turkey has been brined, just sprinkle a few pinches of salt and pepper lightly over the exposed skin.) Lay the pieces on top of the vegetables in the roasting pan, with any exposed flesh down and the skin-side facing up, and sprinkle a few pinches of salt and pepper over the exposed skin. 5. Slide the roasting pan into the oven and roast for 30 minutes. 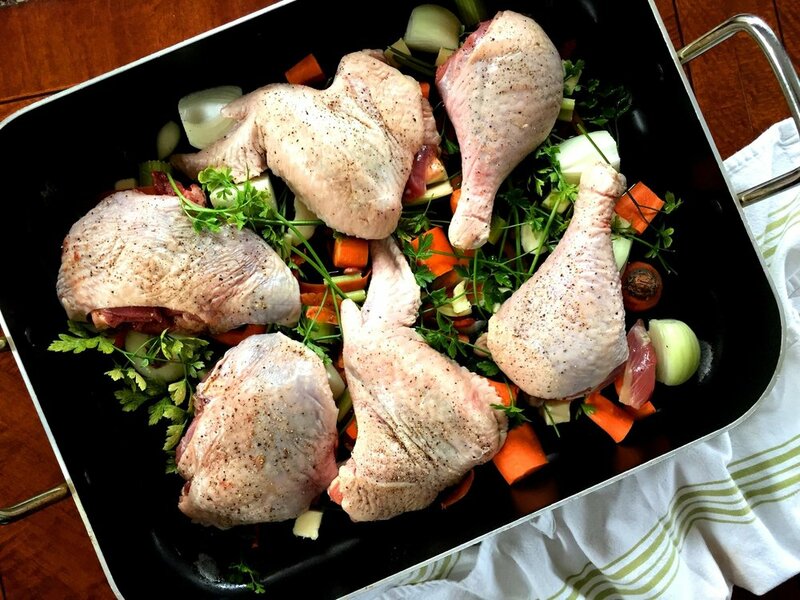 Remove pan, baste with accumulated juices, return the pan to the oven and lower the oven temperature to 325 degrees. Roast another 15 minutes, then remove pan and use an instant-read thermometer to check doneness. Drumsticks and thighs are done when they reach an internal temperature of 165 degrees; breast can be removed when internal temperature is 150-155 degrees. Remove each piece from the pan as it is done, scraping away any vegetables that cling to it, and returning any pieces to the oven that need to cook a bit longer, for 15 minutes at a time. If the pan threatens to dry out (unlikely), add a splash of wine, stock or water to keep things moist. 7. Garnish the turkey with the minced parsley and the additional sprigs of herbs. Serve and enjoy!